Time Life® presents the definitive history of World War 2 on DVD. Now comes a compelling presentation of war from 1939 to 1945, using movie clips and pictures that were rare, hard to find, and even at that time, hard to photograph and film. This project depicts war at a time when war could not be photographed nor filmed as easily as it can be today. No small deal, indeed. This project involved extensive research in uncovering films that had been hidden and previously unseen publicly for being considered too graphic for showing to the public eye; and similar material that had been kept and stored and finally, collected from 18 different countries so that it could be brought to light in this compelling DVD series. 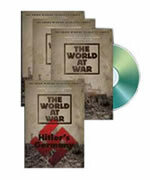 With these DVD materials people are able to witness more closely what war was like within those compelling 6 years that comprised World War I and later, World War II. This was a time when weapons of destruction were neither as powerful nor as adapted for the protection of the user (on the other hand) as they are now. You see stories from the African desert to the German Reich of Adolf Hitler, the horrors of genocide, and the conflict in the Pacific. See the stories of the great generals: Rommell, Montgomery, Tojo, DeGaulle, Patton, MacArthur, Eisenhower. Use the links below to find the best deal on Time Life®.